Can a 4-Year-Old Walk to School? Or Walk 5 Miles in the Snow, In the Dark, in Siberian Winter, Lighting Fires When Necessary, to Fetch Help for Her Grandfather? Little Saglana Salchak has spoken for the first time about her sad 6 hour trek through treacherous snow drifts with wolves around to get to a neighbour’s home from her grandparents’ remote farmstead. Miserable at finding her 60 year old grandmother ‘cold’, she was sent to call for help by her grandfather Borbak who is totally blind. He did not realise the time he told her to make the walk: it was 5 am, a pitch dark. The four year old took matches, which she could use to light a fire, and followed the tracks of a horse sled, partly on a frozen river, which she knew led to the neighbour’s home. Okay, that is ALL amazing, But one bit of that amazingness is that while we worry when kids climb trees, elsewhere kids’ safety DEPENDS on them climbing trees. Clearly this girl was extraordinary even by Siberian standards, or her story wouldn’t have made the papers. 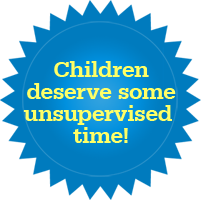 But she reminds us just how incredibly competent kids can be, even — maybe especially — when unsupervised. This is knowledge we have lost just as surely as the knowledge of how to skin a bear, build a sleigh, or make a fire in the forest in the snow in the dark. At age 4. – L.
An Uber for Kids: Genius or the End of Childhood Freedom? 24 Responses to Can a 4-Year-Old Walk to School? Or Walk 5 Miles in the Snow, In the Dark, in Siberian Winter, Lighting Fires When Necessary, to Fetch Help for Her Grandfather? The sad thing is, I’ve seen the “danger” threshold drawn at much tamer things than walking to and from school (or the library, the park, et cetera). I’ve seen on this blog, and in real life, schools, day camps, and kids’ activities that require kids to be signed in by their parents, and then signed out at the end of the activity–even when the activity itself is more “dangerous” than the simple act of walking from the door of the room where the activity takes place, to a parent waiting outside. The most blatant examples I can think of, are the story of the boy whose gymnastics class had that policy, and several Scout or Guide groups who did as well, and actually, I might as well throw Sunday School in there too, because of the whole story about Jesus being left behind at a temple for three days. So, although the four-year-old in this story is certainly extraordinary by Siberian standards, upper-middle-class North America (and similar societies) have such skewed, overzealous safety standards, that a story about, say, a pre-pubescent child walking to school alone, or a brother and sister aged ten and six walking home from the park alone, or hell, even a gaggle of siblings playing in their own YARD without an adult, will make the news, and apparently warrant involvement from child protection. That’s why I like seeing stories like this one–yes, it’s inspiring, but it also gives us the chance to compare and contrast what’s “normal” where we are, versus elsewhere, so we can share it with the “uber-safety” people in our lives, and hopefully get them to adjust their perception of what is and isn’t dangerous. But on Sunday, the Tuva investigative committee opened a criminal case against Eleonora Salchak for leaving a minor in danger. We are stuck in this blizzard with school cancelled, kids are inside (they’d be sledding if it wasn’t sleeting out) and bored. This 4 year-old is amazing. My kids won’t even walk to the neighbor’s house…too wet. Last week we were in Oahu and watched a boy who couldn’t have be older than 6 do a local cultural dance with fire, putting the flames to his mouth and on the heals of his feet, to the delight of the crowd who applauded him! And my 15 year-old son needs to get work permit papers to stock shelves. It’s a bad plan to base policy around anecdotal evidence. Sounds like grandma was already dead when the kid left the house. Why send her on a 6 hour walk to get help in the dark? Did anybody here see the movie “Lion” with Nicole Kidman?? It was a true story about a 5-year-old Indian boy from a poor family who got separated from his 14-year-old brother one night as they were out looking for work. The little guy fell asleep on an empty stationary freight car and he didn’t wake up until mid-morning when the train was now moving and miles down the track. He was trapped and the little guy ended up in Calcutta, 1,600 kilometers from home and where nobody spoke his native language of Hindi. So this 5-year-old boy was on the streets of Calcutta, India for I think 2 weeks where he scavenged for food, got bullied by older street kids and escaped sexual predators. Finally an orphanage picked him up and seeing he was so young, he had no idea where his home was and obviously the orphanage had no idea where to look. So he ended up being adopted and was raised by an Australian couple. Then twenty-six years later, he utilized Google Earth and was able to locate his home town back in India where he went back and found his mother and siblings! The point is, this 5-year-old kid survived on the dangerous streets of Calcutta, India all by himself! Now I certainly would not recommend throwing a 5-year-old kid out on the streets of a major city for an extended period of time and expect him to fend for himself but this just goes to show you how tough and resilient children can be. This movie should be available on DVD, iTunes and Netflix this month and I would strongly recommend seeing it! @SKL, Understood Betsy is one of my all-time favorite books, and probably the best literary example of the argument against helicopter parenting. Incidentally, the author, Dorothea Canfield Fisher, brought Montessori education to the US, was a champion of women’s rights and racial equality, and was one of Eleanor Roosevelt’s 10 most influential American women. @Crystal-my son learned competency with woodworking and power tools at an early age (pictures so darned cute) but would never post them, same with hunting and fishing…too much backlash yet not many bat an eyelash about where there food comes from, just don’t let a kid kill it because it teaches *violence* but playing Grand Theft Auto for 8 hours straight is fine. OT- Has anyone seen the movie Captain Fantastic? I loved it and found it interesting in so many ways about parenting and danger…still can’t stop thinking about that movie. Attacks by healthy wolves don’t happen too often. One source listed only 8 in Russia over a 50 year period. Could this fear be akin to stranger danger with white vans? For the most part, children perform to the expectations of others and adapt to their environment. Saglana can do what is expected of her. She grew up believing she has this capability because of the people around her believe that she can do this. This works the other way as well. They want to be ‘good’ parents and follow the trend of ‘spoon-feeding’ them life. I apologize if I have been judgmental lately. However, I consider this is also a danger. I see the connection between this ineptness and anxiety/depression so vividly that I don’t understand why this is often dismissed when determining whether something is dangerous or not. I also acknowledge that the ‘everything is dangerous’ attitude is not exclusive to parents. Employer pushes that as well. I don’t know how bad it is in America. However, in Australia, some companies require you to have ‘office stapler training’ before you’re authorized to use an office stapler! Wow, what a story! For every abducted kid story there’s a story like this – both are outliers. Possibly, but have you ever been in the woods, at night, when wolves start howling? It can be very disconcerting. James, you are confusing youthful ability with criminal activity. These are two separate things. You still don’t seem to get the reason this blog exists. Please, I do wish you would figure it out. Yes, you made a mistake. You completely missed the point. Feel free to try again. Or don’t. I’ll try to help you, even though you’ve chosen a condescending tone which is badly mistaken.. The point was “It is a bad plan to build policy around anecdotal evidence”. Here, we have a case of one young girl, who achieved something difficult and challenging successfully, one time. This is not evidence that children, generally, can do this. It isn’t even certain that she could do it again, if called upon. To find out what children, generally, can (or can’t) do, you need to examine the cases of many, many different children. Using a single data point to argue what is generally true is a tool that can be easily misused, as in the three counter-examples I offered. If you don’t like it when someone tries to argue “children just aren’t safe in the U.S.! Adam Walsh!”, you shouldn’t say “4yo children can walk around in the snow, lighting fires when they need to! Saglana Salchek!” because both claims are equally inapplicable to vast majority of individuals. And I hope you manage to obtain a grasp on reality. I really and truly do. Buh-bye now! George: The activist is an idiot who clearly has no clue about conditions in rural Siberia. If there’s no cellpone connectivity, sometimes it’s because there’s no solid ground on which to build a tower (large chunks of Siberia are a permanent bog), and even then there may be only one or two users in range. And we don’t put cell towers in remote parts of the U.S.; how much less should it be expected in the far-more-thinly populated tundra? dancing: *fatal* wolf attacks are rare, But threats happen a bit more often. I myself know people here in MT who got chased out of their hunting camp by wolves, and had to walk backwards, gun in hand, several miles to the nearest road (where they’d left their vehicle), with the wolf pack following not 20 yards behind all the way. But it’s not that wolves wouldn’t take a lone human; it’s that the back country is BIG and you’re just plain unlikely to run into them, and if you walk like you own the road, as I’d bet this brave kid did, other predators are more likely to leave you alone. Regardless, this kid is a beacon of competence in a bubble-padded world. Imagine what your kids could accomplish if they had the same grit. @Joan- Who knew! Especially the part about the Montessori education! I personally found *Understood Betsy* to be one of those books of “why use one word when five will do?” but its message is pretty good and maybe I’ll see it in a bit of a different light next time. It’s on the literature list I use with my children in our homeschool, so it’ll come up for my son in a year or so. I so wish I didn’t follow that link.To each his own with parenting, but age and capability aren’t a guarantee, unfortunately. I know many adults that shouldn’t handle tools. The writer wants an actual age and affirmation so she can NO to her son, with the only factor being his age (15) and nothing about his demeanor, maturity, and competence. That is what is sad. I received several texts messages a few weeks ago and links to the anti-slime articles that warn of the long term health effects to mixing these flubber/slime/putty chemical compounds at home- my daughter is a lover of mixing these sticky horrors in our laundry room and kitchen, she loves to mix and create….everything. I know several good friends that threw out all of their kids materials (could you save me the glue??) because of this one article saying your kids would be infertile if they touched this stuff. Jumping to conclusions and stifling creativity….it seems to be spreading like a parenting virus. It seems that whenever the posted story here is about a competent child who does something we think is out of the ordinary, few readers comment. I wonder why these kinds of stories don’t inspire bunches of readers to post about how their own kids did amazing or courageous things? Children crave independence. They tend to want freedom and to not be controlled by their parents. as a child, my siblings and I were routinely banished from the family home during the day and encouraged to roam free for hours on end. With the family home surrounded by bushland we were quite safe, but such laid-back parenting style is quite rare these days.